Well, after this weekend Little Sis will officially be a preteen. Only one year left until my baby will be a teenager. :0 It just doesn’t seem possible to me that all my children will be teenagers. I knew it would only be a matter of time before the sleepover invites would start to appear. After all, she loved cheer camp. I have been lucky with Sky in that she is a homebody. I mean she has friends, it is just that she is okay with talking to them online. She doesn’t need them to be with her in person all the time. Little Sis, on the other hand, is the complete opposite. The more in person friends she has, the better. She is a very popular child. The fact that she is homeschooled has not affected this in any way. I will be honest though, you may see a tiny smile appear at the corner of my mouth when I drop the homeschool bomb and get the shocked look on people’s faces back in return. Yes, this extremely outgoing, confident child is a homeschooler, never once having set foot inside of a school building. Then, more shock once I reveal how terribly shy she was. Little Sis was attached to my hip the first six years of her life. Don’t get me wrong, I have seen, first hand, terrible examples of homeschoolers not being properly “socialized” (I really dislike the word socialized. It makes me feel like I am talking about dogs or something.). However, I have also seen, first hand, terrible examples of school children not being properly “socialized” as well. Maybe, just maybe that’s because schools do not “socialize” society. Schools are meant to educate society (As well as training them to be obedient little workers, but I digress.). I just decided to educate my children at home. It is what works best for us. My girls are still apart of society just because they don’t go to school. We don’t live on an isolated island. Sky, is Sky. Little Sis, is Little Sis. Where they receive their education does not change that. Being raised in a healthy, loving, nurtured, accepting environment does. 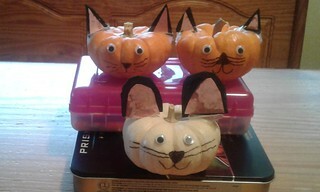 Since Halloween was this week, I tried to focus our lessons around it. 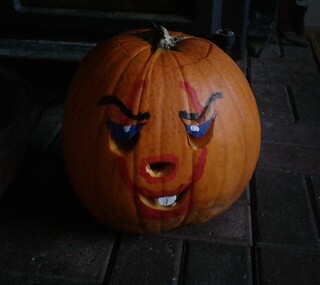 Sky decorated our pumpkin this year. Little Sis didn’t want to go trick or treating this year, she went to a party over the weekend, but wanted to help pass out candy instead. 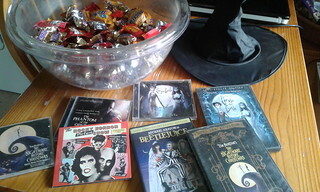 So, I busted out a few of our Halloween favorites and we all dressed up. 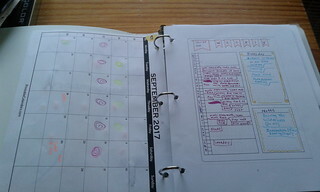 It was my turn to pick out our meal to prepare this week (I made it to my recipe plan page in my mom journal.). 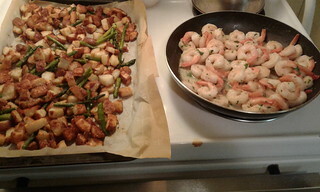 I chose cilantro lime shrimp with garlic parmesan roasted potatoes and asparagus for dinner. I learned that when you add lime to shrimp it makes sort of a buttery sauce. The recipe is literally just shrimp tossed with a little salt, cumin, and cilantro. Then squeeze the juice of half a lime over the top once the shrimp is cooked. That is it. 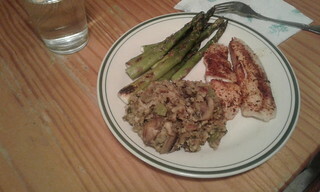 This meal was a huge hit with the family. and dessert was chocolate chip dunkers. 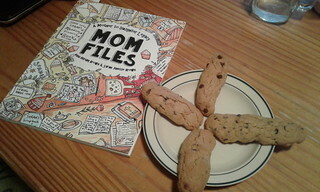 Both recipes were from the Mom Files book. The dunkers are delicious with coffee. 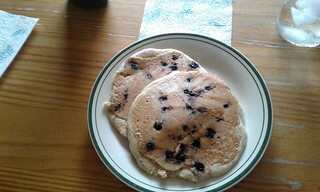 The pancakes were really good too, I just have a vegan pancake recipe that I already make. Lunch was just apple slices dipped in peanut butter. I also made vegan teriyaki tofu and broccoli this week for dinner that was a hit with everyone, including Papa. We read the biography of Edgar Allan Poe from Lives of the Writers and watched the PBS Amerian Master’s documentary Buried Alive. 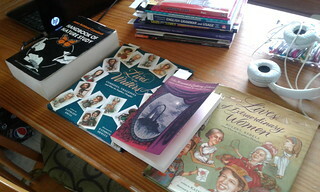 It was nice to discover that the author of Lives of the Writers is correct with her research. 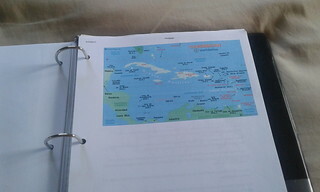 There is a lot of information packed into this little book. 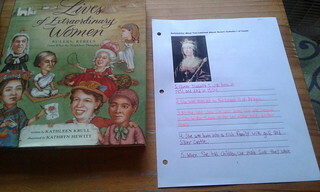 The girls chose their spelling/vocabulary words from the biography. and NOVA’s Why We Like Being Scared. and read October’s issue of Kids Science in the News A-Z. We listened to Erhu music while journaling and learned about Egypt from Geography Now. Then as if it was planned (this week airing on PBS Nature was the episode H is for Hawk), one of the sparrowhawks that live in our neighborhood decided to perch on our backyard fence. Boy, it was huge. Like, almost the size of our dog huge, but beautiful. It stayed there a good 20 minutes until a squirrel, of all things, chased it away. So, we ended up watching H is for Hawk and learning more about hawks this week. 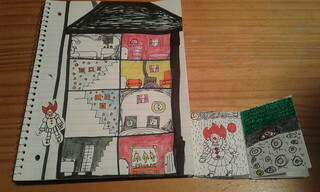 Drawing inspired by Art for Kids Hub on YouTube. Sky finished Monstress (and is ready for volume 3) and we finally finished chapter 4 of Braving the Wilderness. I think after all this year’s changes, we finally have found our groove again. I knew it was only a matter of time. I still catch myself adding on extra work. Now the girls are not afraid to call me out on it though. I don’t understand my need to keep adding on resources. I look at my notes and think, how many resources does one truly need to learn about dogs. This is why I love being able to journal alongside the girls. It gets me away from the internet. They are learning. 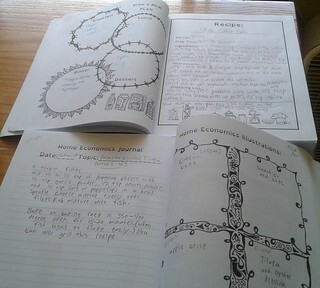 One thing I really like about using The Thinking Tree journals is that it holds me accountable for the resources we use. It basically tells you to find 4 -8 resources you want to use to research your subject. These are the resources you will use for the year. I think a lot of my problem is that I want to learn every bloody thing there is to learn about something (my OCD). This would not necessarily be a bad thing if I had an endless amount of time. Unfortunately, that is not the case. This is another reason I decided to use curricula this year. 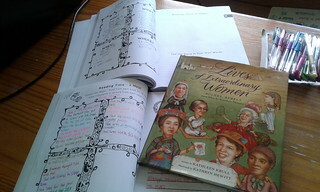 If there is a subject that the girls want to dive deeper into, they now have the time to do so on their own. 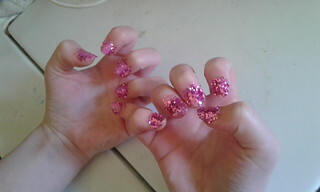 Little Sis has no problem finding new nail ideas to try out. Sky has no problem finding new film YouTubers or art ideas. Sky watched all of the Crash Course psychology videos on her own because she wanted to. The majority of Sky’s film study videos are ones that she found and shared with me. I still believe that a child learns best by following their interests. Something that the girls have shown interest in lately is trying out more vegan recipes. Little Sis is almost a vegetarian, with the exception of eating seafood occasionally. I have mostly given up dairy with the exception of cheese once in awhile. We rarely eat beef or pork because of Papa’s heart disease anyway. It just feels like it is time to take the next step. So this week, all our meals were either vegetarian or vegan. Some were major hits (I’m talking about you veggie enchilada rice and black bean dip) with the girls fighting over the leftovers. Others, like the vegan bbq pineapple pizza, were hits for some but not for the Papa. We will still eat poultry and fish every now and then, Papa loves them too much, but more as a special treat than the everyday meal. 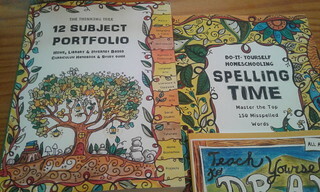 I purchased another Thinking Tree book, while it was on sale, that we will be using for culinary arts (along with the Teen Cooks book). As a secular family, I will say this book is not secular in any way. It is written from a Christain perspective and contains many verses from the bible. However, it makes for a great conversation starter. I’ve never agreed with the one-sided learning of any kind. Society is not one-sided. In fact, this is exactly the point of the book Braving the Wilderness by Brene Brown. This has also been my beef with the whole “socialization” argument. Just because you go, or went to school, does not make you properly socialized. and Charles Wheatstone and his invention of the polar clock. as well as some of the same. Sky and I are still in chapter 4 of Braving the Wilderness. It is a very meaty chapter. So many discussions. Wishing everyone a safe and happy Halloween. Well, so far my plan is working. 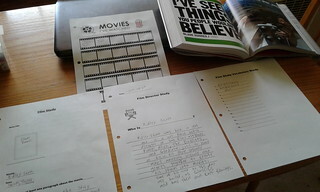 My goal was to have a set amount of time put aside for lessons, allowing for plenty of free time to explore interests. Little Sis has been busy making slime. She is wanting to start selling it to earn money for cheer camp this summer. She is getting really good at making it too. 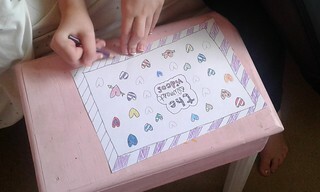 She has also been playing around with designing her nails so that they look good in her slime videos. If she was not given the freedom to explore these interests, look at all the learning she would have been missing out on. She is mastering skills, learning what matters to her. Sky is still uncertain about what she wants to do regarding her interests. That is okay. We had lots of talks this week, especially since starting Sociology, about how society adds the pressure of teens needing to know what they want to do right after high-school. Hell, I am still learning about myself. I actually learned something these past two years of pushing “college approved” transcript lessons. Even though the workload has gotten harder, they really are not learning to take responsibility for themselves. They still have a teacher telling them what to learn. They are still told what they need to do and if they don’t care about what they are learning, then what happens to them? Then, if they do make it to college, it’s like a whole new world. This is why I love the Thinking Tree Journals so much. It places the responsibility of learning back onto the children. I have seen a big difference in just two weeks. Both girls can take as long as they need to figure out what they want to do with the rest of their life. There really is no hurry. It is a very big world with lots to see and do. So many choices and we never stop learning. We are no longer the same society that existed when schools began. Where the school was once the only place to gain knowledge, I now am able to carry knowledge around with me in my back pocket. Now, schools are outdated. I feel like Sky needs time to deschool all over again. We need time to build that trust back up. There is only so much that Papa and I can provide for them. They understand that. They both have future goals that they will need to eventually figure out. Little Sis is already doing that. This year, I’ve decided that Sky will tag along with Little Sis’s learning journey, while she decides what she wants to do. Our lessons have always been the other way around. 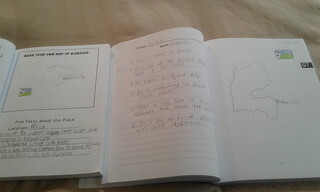 I have noticed in these last two weeks of journaling, Little Sis was beginning to get gaps in her learning. Things she never really learned how to do because my focus was more on Sky’s learning. So, what are the most important topics one needs to learn? What topics will they both need to know that will help fuel those future interests? 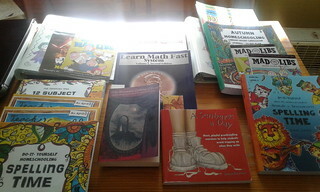 Reading, writing, and mathematics. All other interests branch off from these topics. Between The Thinking Tree journals and Learn Math Fast, we’ve got them covered. I honestly wish both had been created a whole lot sooner. One thing I do want to mention when first flipping to fun-schooling, is to be prepared for your children to feel lost at first. Up until now, if you were like me, they have been spoon-fed their education. Fun-schooling places the responsibility back on them. Like when they first learned to eat using utensils; it was a little messy at first. 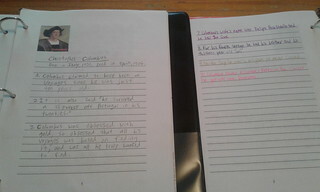 We are using the journals a bit different than how they are “intended”. Though, that is kind of the point of us ruling the curriculum. The girls don’t fill out a certain amount of pages in a day. We fill out the pages as we need to. Sometimes that is one page a day, sometimes it’s more. One day they might write out the notes. Then the next day they create the picture. It is all up to you, and this year I am joining them with a journal of my own. So many times you will hear homeschooling parents mention how they are learning right along with their children. 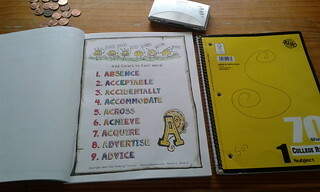 Now you can work right along beside them with your own Mom School journal. I have really enjoyed the time we share together. I know it won’t be long before the girls start going their own separate ways. 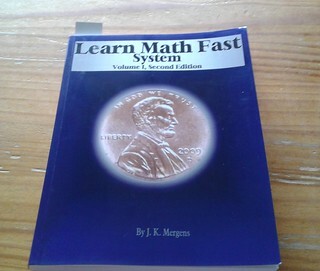 I am really glad I purchased volume one of the Learn Math Fast books. I almost bought volume 2 on up. The author teaches you how to mentally figure out the answers to the problems, like 56×11. I learned a few tricks too. Yes, I can now figure out the product in my head. Sky is doing great. I am so proud of her. She has come such a long way. 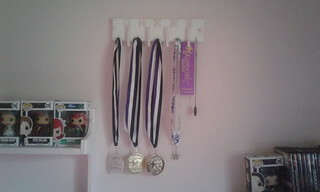 This is one area where I found Little Sis to have a few gaps. Something else I am doing this year is Little Sis and I have a create a meal plan journal page. So, I thought why not let the girls create their own meal plan for the family one day. They are in charge of picking out the recipes and making sure that all the ingredients get added to the shopping list. Then, the girls help make the meals. Every other week we will take turns choosing the menu for that day. 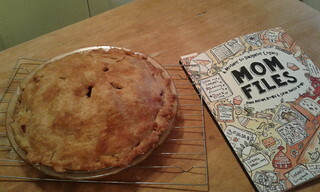 I purchased the book, Teens Cook by Megan Carle to help influence some of their choices. Little Sis’s journal page came up first, so she got the pick first. She chose baked chili crusted tilapia with roasted asparagusus and oyster dressing for dinner. 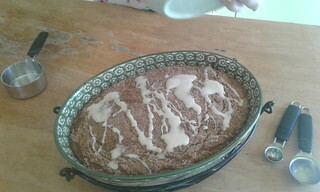 Vegan coffee cake for breakfast. 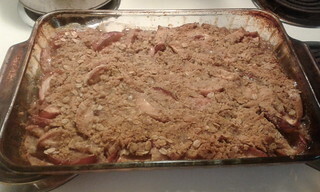 Sandwiches with baked chips for lunch and apple crisp with frozen yogurt for dessert (the only recipe that actually came from the Teens Cook, book). All of it was delicious. They did a great job. Sky and I started chapter 4 of Braving the Wilderness. It started a conversation that lasted days. We also watched a YouTube video from National Geographic titled, What Makes Us Happy. 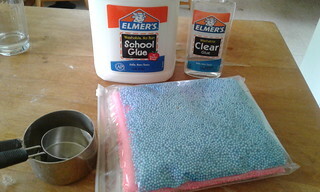 For a science project, I decided to finally make slime with the girls. I can see why it is so addictive. I love it! 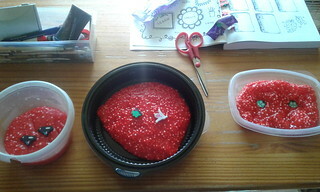 We made blood plasma slime, which fit in perfectly as a lab project for Microbiology. We used clear glue, Borax, red food coloring, white foam balls for the white blood cells, red foam balls for the red blood cells, and mini erasers for the platelets (probably could have used purple foam balls). Wishing everyone a wonderful weekend. Peace for the journey. 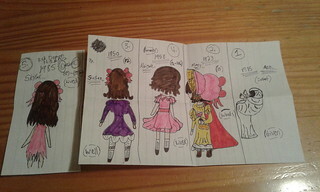 This is my last post categorized under 16 (at least until Little Sis turns 16 anyway). Sky turns 17 this weekend. I am still in disbelief about her being 16. What a journey it has been. I have learned so much from her. Not only as a parent, but about myself as well. What a bittersweet experience it has been to read Braving the Wilderness together just as she is beginning her journey from childhood into adulthood. I think between the two of us, we highlighted all of chapter 3. 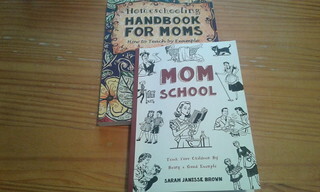 I thought this week we could take a peek into what I keep in my Mom-schooling basket. We live in a small house. When I say small, I mean less than 1000 square feet. I keep my basket under the end table on my side of the couch in our front room. This is the spot where the majority of my thinking takes place. I’ve mentioned previously how journaling helps to clear my thoughts. I think the most important item that I keep in my basket is a spiral notebook and pen along with my Dollar General planner. Anytime I get an idea about something that might be of interest or I discover a television show coming on that we might want to watch, I know exactly where to find my stuff. I need to write everything down or I will forget. Then while planning out our next week, I look to see if I wrote down anything that might be of use to our learning journey. 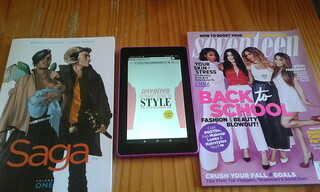 The next most important item in my basket is my Kindle Fire. I mentioned our small house, yes, our space is extremely limited and my book collection would take up a whole room in itself. (and this does not even include our music collection.) Don’t get me wrong, I love the feel of a book in my hand. The smell and sound it makes when turning a page are amazing. 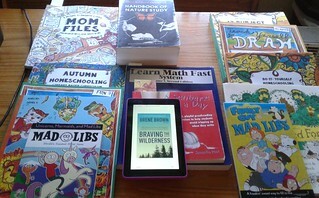 However, for the sake of maintaining peace with my husband, I purchased my Kindle Fire. Now, I use it for everything. Books I am currently reading are Sleeping Beauties by Stephen and Owen King, which I am now over halfway through, and Braving the Wilderness By Brene Brown. 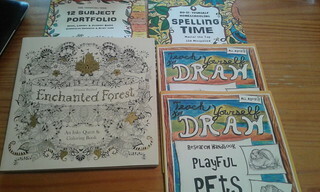 and a few of my other favorite resources. Sky’s basket (I keep the girls’ baskets in the kitchen by our table where they do the majority of their work.). They each have their own Kindle too. 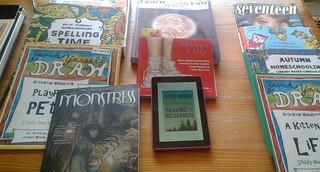 We get the majority of our library books through Overdrive (no late fees). we learned about Miguel De Cervantes. Sky and I watched Thug Notes’ version of Don Quixote on YouTube. She added this to the film and tutorials page in her Portfolio journal. We watched Tango videos on YouTube and learned about Eva Peron. Little Sis had spelling words beginning with the letter B this week from her spelling journal. So, we watched a video about Black Bears from All Things Animal on YouTube together. We listened to banjo and bluegrass music while journaling and learned about Belgium from Geography Now. PBS Nature this week was all about Foxes. Sky’s second most favorite animal after the wolf. We were lucky enough to observe one while at Wolf Park this summer. So when I saw PBS was airing a documentary about them, I added the date to my planner so I would not forget. 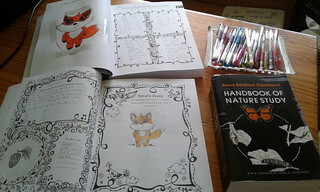 I read about Foxes from the Handbook of Nature Study and we watched What the Fox Says from Scishow on YouTube. We looked at images of their prints observing their difference from dogs, and the girls added notes to their core journals. We drew a fox from Draw So Cute on YouTube. Little Sis learned about Liz Claiborne. and Sky finally was able to see IT at the Drive-In. She loved it. They had a clown going around to the cars scaring everyone with red balloons. We had a lot of fun. She is looking forward to seeing Blade Runner this weekend. I am just trying to absorb as much of it while I still can. So, after a week of trying to make my own journal pages and making sure that I had everything printed and ready for the week, I decided to go ahead and purchase the fun-schooling journals. I just have too much on my plate as it is right now. Honestly, one of the biggest needs that I had this year was an open and go curricula. Something that would help to keep me on track. 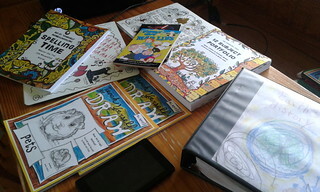 I couldn’t believe my luck of discovering The Thinking Tree and their journals. They have the structure I need but allow for the freedom to still do things our way. I purchased (Yes purchased, not received. 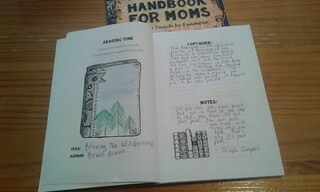 I did win the Mom School journal from Free Homeschooling 101. 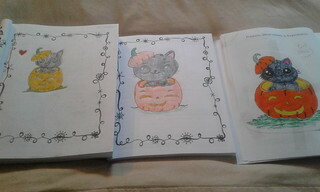 The rest of the journals I purchased myself because I truly love them. ) the 12 Subject Portfolio for Sky as her core journal. She has always been the child that wanted to do things her own way in her own time. If you couldn’t already tell that from her artwork. She would despise the structure of the other library based journals. Some great advice that I learned from Homeschooling 101 is “We rule the curriculum, the curriculum does not rule us”. The journals work for us, not the other way around. That is exactly why I like the 12 Subject Portfolio for Sky. Little Sis, on the other hand, needs structure. She needs to open her journal and know exactly what to do. 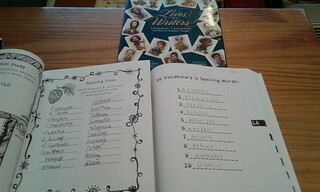 That is why I purchased the Autumn Homeschooling and the Spelling Time: Animals and Instruments level C journals. 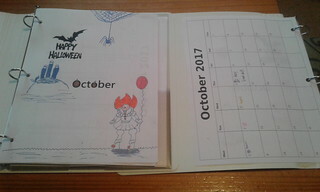 Okay, what I liked about the Autumn journal for Little is that there was no circle the date pages. This way we can use the pages however we want to. Not necessarily in any specific order. I still print out calendar pages for them to take their own attendance. 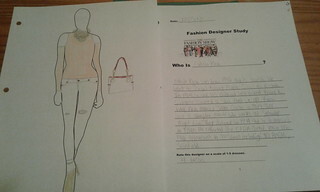 After we finish our travel study of Spain, I plan on using the Fashion Journal for learning about American History. So, Science through art (two for one) and History through fashion (Yep, you guessed it. Two for one.). 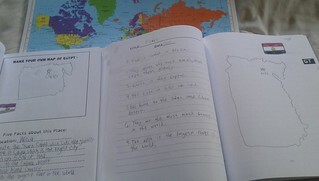 Then there is the spelling journal that brings in geography and music. Some of Little Sis’s spelling words this week were Argentina and accordion. So while working in our journals (mine too) we listened to accordion music on YouTube. We listened to The Beer Barrel Polka and Roll out the Barrel. We also listened to traditional French accordion music so that the girls could hear how one instrument can be used to produce different styles of music. We watched Geography Now on YouTube to learn about Argentina. 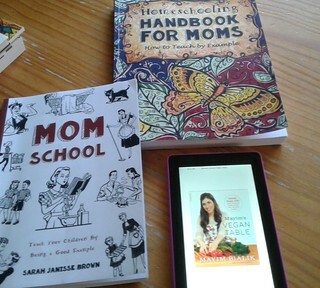 Speaking of journals, besides the Mom School one that I won, I purchased the Homeschooling Handbook for Moms journal so that I can also work right along with the girls. I love the discussions ( not to mention just being able to get away from the internet for awhile) that journaling has allowed time for. Sky and I read and discussed chapter 2 of Braving the Wilderness. She is journaling about this book in her portfolio under Social Studies, or what we are calling Social Science. Sky and I watched episode 2 of Crash Course Sociology. As part of Sky’s film study this week, we learned about Evanghelos Odysseas Papathanassiou, or Vangelis, and listened to the Blade Runner soundtrack. 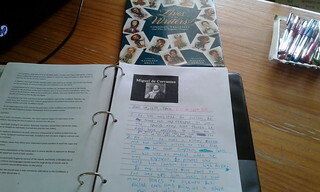 and the girls added Christopher Columbus notes to their history timeline binder. We also watched the Origin of Everything episode about Columbus and cannibals. 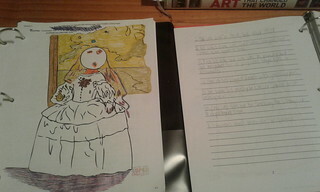 We learned about the Dada, Surrealism movement and Salvador Dali. We watched: Why Melted Clocks from Artrageous with Nate. 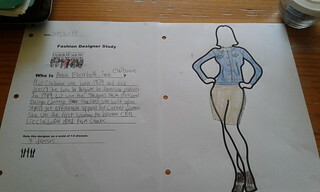 Little Sis and I watched How Jeans were Invented from Ted-ED on YouTube and she learned about Calvin Klein. 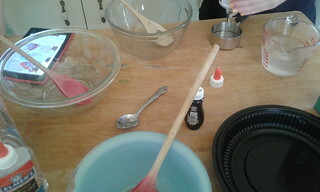 She also made butter, glitter, and peach slime. Sky started Monstress volume 2: Blood, as her independent read. The first attempt at solo drawing. We have officially flipped to “funschooling”. 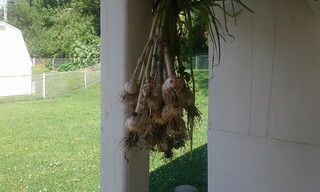 While writing my last school post, I realized the reason we took the summer off. We all hit burn-out (like a brick wall). It should be no big surprise to announce that I have OCD. Not only do I suffer from anxiety and depression, I also have obsessive thoughts. So much, to the point of major insomnia (like for weeks at a time). I can go days without sleeping. How I can get so much reading in. 😉 I have successfully been caffeine free now for three years. Caffeine, at least for me, was not helping with my struggles. I also need to watch my sugar and simple carb intake. My problem is that I tend to get lost in information. (The internet is not always my friend.) Once I discover something of interest, it is hard for me to think or do much else (I am not just talking about a little bit here either. This is a serious problem that has interfered with my daily life.). 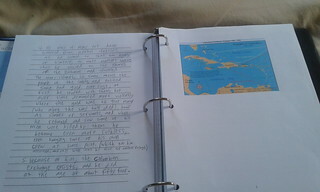 Journaling helps to clear the clutter of my thoughts. 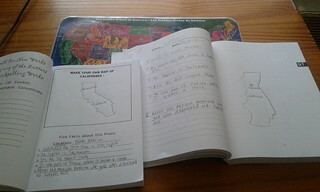 I had become obsessed with making sure I knew everything there was to know about homeschooling high-school. 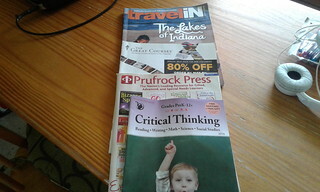 In some ways, it was just like when I had first discovered homeschooling. I wanted to make sure that I wasn’t going to screw up my daughter’s future. I pushed aside everything that I had learned over the years of educating my girls, once again, to listen to the advice of what worked well for other families. After all, high-school was all new territory for me. It is not the same as the early years. Well to make a long story short, I added a tremendous amount of stress to Sky in doing so. It is not an easy thing to admit that I played a major roll in my daughter’s mental health problems. I did though. Not to mention that I belonged to a social media homeschooling group where everyone’s child was heading to MIT at 10 that did not help matters. I don’t know what the future holds for my children, but there will be no more pressure coming from me. I have never been a follower, why on earth would I ever think that my children would any different? We create paths. So this year, I asked the girls what they wanted to learn. 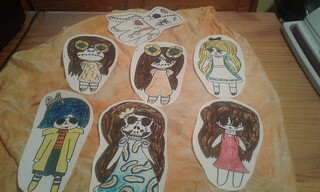 Little Sis: drawing techniques, cats, fashion, hair, make-up, nails, baking, cheer, pilates, Cleopatra, read Emma, slime, yoga, sewing, bowling, swimming, travel study, and outer space. 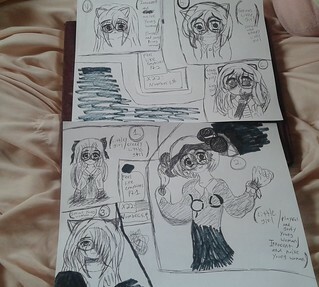 Sky: drawing techniques, pets, art history, sociology, psychology, film study, entrepreneurship, small business, screen printing, book binding, baking, travel study, sewing, yoga, wolves, animation, bowling, and swimming. Both girls want to finish Microbiology. We will pick it back up after our Spain study. 2. 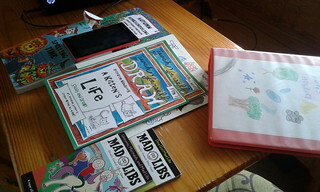 Find a Thinking Tree journal(s) that works for their needs. 3. Go to the library and find resources to help learn these topics. 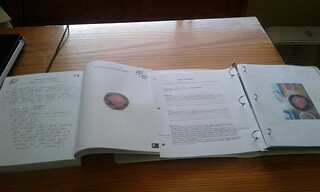 I purchased binders for the girls, to hold all their finished projects to help create a learning portfolio. Every morning we start our day with a journaling page while we eat breakfast and discuss any current events. This is what the girls want to do. We talk about what is excepted of them for the week (I find our mornings flow better if I already have this typed and printed out for them.) and they take their own attendance. 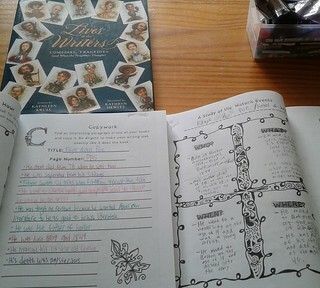 I find our days flow better when alternating between math and writing days (the two things that I require). 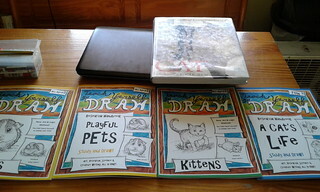 For creative writing, Sky is creating illustrated stories. She works on this everyday too. For Mathematics (3 days a week). 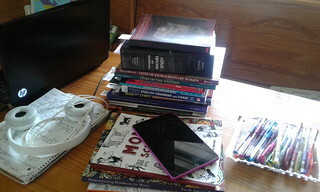 History and Travel Studies. 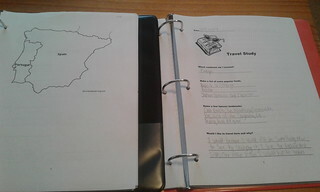 The next few weeks we will be learning about Spain, with the help of Rick Steves. This week we read about Queen Isabella 1 of Castile. We also read September’s issue of Science in the News from Science A-Z. The girls wrote a paragraph about one of the topics they learned about. 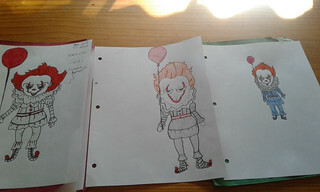 Sky wanted to draw Pennywise from Draw So Cute to get ready for our Halloween themed lessons. 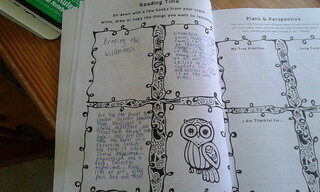 Sky and I read and discussed chapter 1 of Braving the Wilderness. We both are journaling our thoughts about each chapter. We also watched Crash Course Sociology episode 1. For her Film Study this week, we watched Blade Runner. She is excited about seeing the sequel in theaters. We watched: Blade Runner from Lessons from the Screenplay on YouTube and read the excerpt from the DK Movie Book. We had a great discussion about AI and the current debate going on currently. This movie also went really well with our Sociology study this week. There is SO much more to this movie than just great cinematography. She also learned about Ridley Scott. 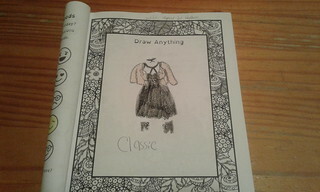 Little Sis learned about Betsey Johnson for her designer study this week and designed a dress inspired by her. 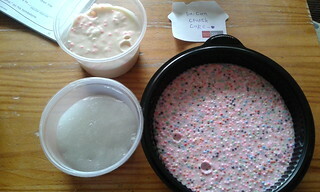 She made snow slime and edible cake dough slime. 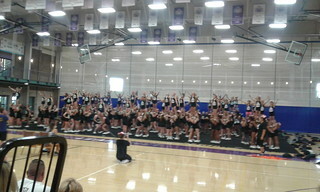 Then, of course, there was cheer practice. Her team is getting ready for stunt clinic this weekend. Oh, and she also participated in our city’s local parade. I still have a few kinks to straighten out, but the girls had a lot of fun this week. Yes, fun. Everything is what they want to learn about. Happy Fall Y’all and Peace for the journey. Not to mention, while on a walk around the block the girls saw two small dogs almost get hit on our very busy street. The girls have no patience for ignorant pet ownership. The girls and I had lots of long talks this week. Talks about their future, what they wanted to learn about this year, and what they didn’t like about our school schedule now. I just won’t do it, can’t anymore. I refuse to recreate the same bloody system that I didn’t want my children to be a part of in the first place. So after lots of thought, I’ve decided to follow their interests and translate their learning into school language for transcripts. I don’t want to define us as unschoolers. I don’t want to box us inside of any label. I will still require mathematics and writing. Though, both girls actually want this anyway. Both girls have always enjoyed creating their own stories and playing games. Sky and I are getting ready to start reading Braving the Wilderness by Brene Brown (when our hold becomes available) because she wants to. The girls want to learn. They just take too much after their parents. How will all this work out in the end? Frankly, my dear, I don’t give a sh**. I am done worrying about putting learning into a time-frame. Little Sis is thinking about getting her GED and going to beauty school instead of high-school. She wants to do hair, make-up, nails, and be a cheerleading coach or aerobic instructor. If Sky wants to take two more years before she decides what she wants to do, so be it. 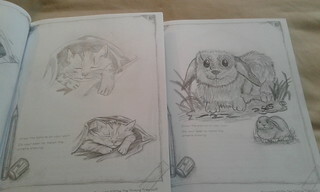 She wants to work with animals or children, and sell her artwork. I feel both girls are capable of achieving these goals. Both have the option of taking community college classes whenever they want or they can get their GED. I used to work for Sallie Mae. I know first-hand stories of the stress student loans cause. I will not allow that option for my girls. If they can’t get scholarships into a university, they won’t go. As of right now, the girls are not interested in attending any university. However, I will have a transcript ready if they happen to change their minds. One that is made from following their interests. So, that means making sure the girls have everything they need to feed those interests and “strewing” interesting items that might spark some some new ones. Something I am going to start doing this school year to help keep track of the girls’ work is have them keep a journal to make a portfolio. 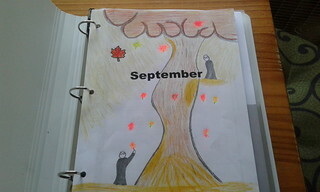 I got the idea from The Thinking Tree (Fun Schooling) journals. 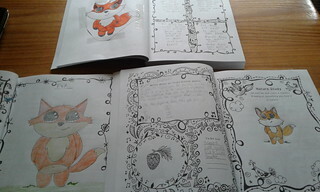 I really liked the idea of their journals a lot but feel the pages are a little restrictive. 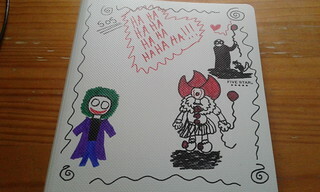 So, I thought I would just create my own journal pages. I already was doing that for our history lessons anyway. 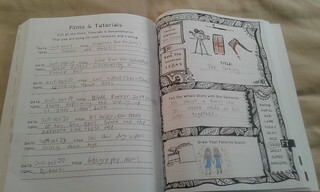 I love the Absolutely Essential Guides for Kids. 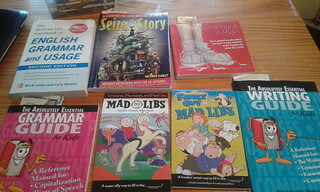 Don’t be fooled by the title, these books are not just for kids. 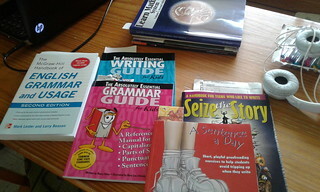 They have everything you need to know, in a nutshell about grammar and writing. The Writing Guide even has a chapter on poetry. Sky likes her new Spelling journal from The Thinking Tree. She is slowly working her way through it. The back of the page is left blank so you can use gel pens. I love the way this journal is set up. Sky likes how this journal is set up. Both girls wrote out a summary of their week. Well, Little Sis will finish tomorrow since her cheer team is in our local town’s fall parade. I will be changing up these journal pages throughout the year. 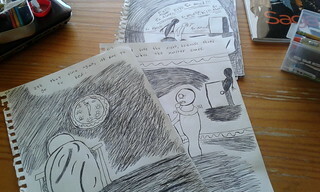 and Sky worked on her graphic novel. Both girls warmed up using XtraMath.org. I have noticed a huge improvement in speed while going over the first chapter of Learn Math Fast. I know this is because of XtraMath. We are almost finished with chapter 2. Sky watched Crash Course: The Spanish Empire and the Columbian Exchange videos on YouTube. She honestly likes both of the Green brothers. She watches their videos in her free time. Yes, without me asking. We watched Geography Now’s The Bahamas and Cuba videos on YouTube. I ditched Zinn’s History of the U.S. for Young people. Just when I thought it couldn’t get any worse (read last week’s tangent), it did. The girls literally cringed every time I read “the blacks” and “the whites”. I can’t take you seriously as a legit history source while writing that way. Not to mention, “the whites” did not resort to slavery because they couldn’t capture “Indians”. Slavery existed because of the dehumanization of different cultures. I don’t care what “age” range this book was designed for. That is just plain out garbage. Thank goodness I checked it out from our library first. We will continue with the “Who Wa”s or “What was” books. Little Sis really likes them. 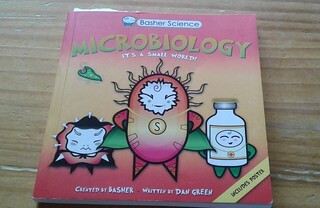 We will continue reading the Basher books because the girls like them. I will be creating journal pages for them to fill out after each chapter to summarize what they learned for their portfolio. I mentioned feeding an interest? Little Sis wanted to try to make clear slime. It worked. We watched bad scientific information about Borax from Steve Spangler on YouTube. Contact solution contains Borax. Sky is excited to see the new IT movie. We plan on seeing IT at our local Drive-In, in October. They will be having a Halloween “spooky” month countdown. They are a small family business and we love the atmosphere (we can bring our dog). Until then, she has been busy creating. 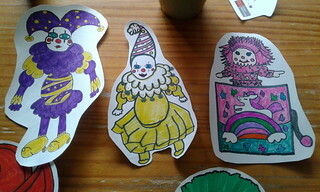 We watched PBS’s new Origin of Everything series video about the origin of fear for clowns on YouTube. We watched two CGI animated shorts about beauty, called Reflection, and art censorship called None of That on YouTube. This was our first year taking summer off. Well, not really off. I mean learning never really takes a break. I guess I should say that our summer was less academic looking. We are busier socially now that the girls are older. We have more outside commitments now too. This means the bulk our academics need to take place at the table. It also means I need to narrow topics and follow a more structured schedule. Something that will require lots of discipline on my part. 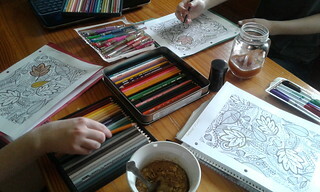 There is SO much available to homeschoolers today. 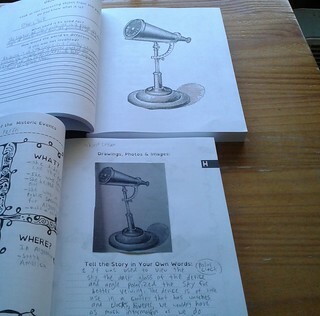 Homeschoolers that have finished their journey are publishing curricula. Teachers are uploading their lessons online. 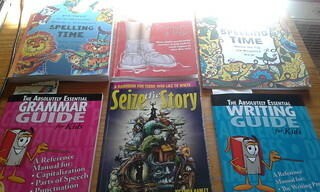 Publishers are seeing homeschoolers as a wonderful asset to their business and releasing more books. Podcasts, YouTube videos, information at our fingertips, and man I am beginning to feel overwhelmed. Not to mention that I have two very different children with complete opposite learning styles. So, I picked out my favorite spine resources and wrote out my plan. 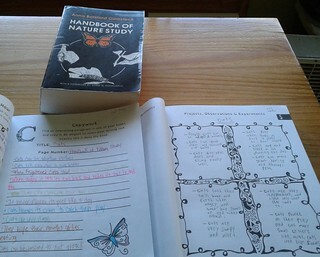 I have always preferred to work out of a book for my spine and then add resources for deeper study with the girls notebooking, or journaling information instead of taking tests. This creates a portfolio and lets me see the girls’ progress. 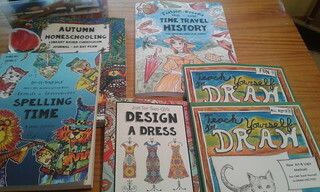 I purchased 5 subject spiral notebooks for mathematics and language arts courses and the girls will continue to add journal pages to their timeline binders for science and history. 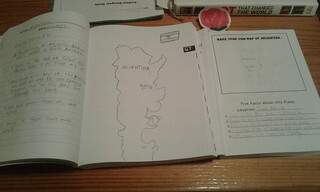 I decided to finish our Scandinavia studies over Christmas School. It just seems more fitting. English Vd: Parts of Speech YouTube. We watched Nouns. Little Sis read about Nouns from The Absolutely Essential Grammar Guide for Kids. Sky read about Nouns from The McGraw-Hill Handbook of English Grammar. 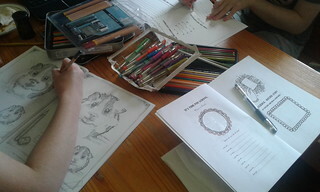 Both girls completed the nouns daily exercises from Daily Grammar.com. The girls had A Sentence A Day. 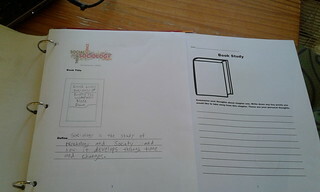 Little Sis is continuing her work in The Critical Thinking Co. Word Roots Beginning workbook. Sky started The Thinking Tree LLC. 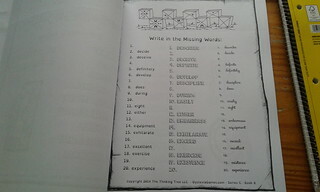 Spelling Time: Master 150 Misspelled Words journal. This is a small example of how differently the girls learn. 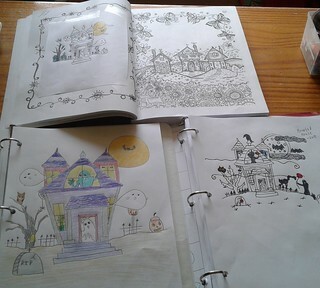 Little Sis wants clean workbook pages. Sky needs color and doodles. Spelling lists and memorization do not work for her. Reading: Seize the Story Chapter 8: Plotting and Scheming. 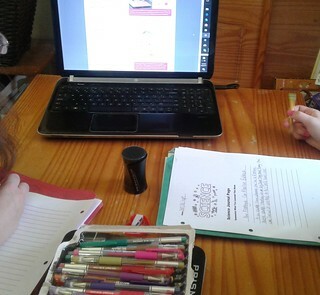 Both girls worked on writing their stories for at least 10 minutes a day. Sky received her first essay assignment for the school year. What does it mean to be an American? 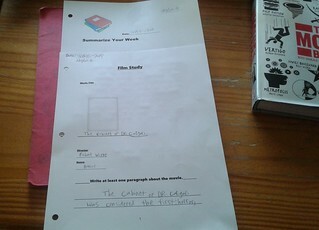 She watched: Thesis Statements from 60-second Recap on YouTube and read Developing a Strong Thesis Statement from Writeshop.com. She brainstormed ideas for her thesis. The girls started Learn Math Fast Volume 1 chapter 1. The author suggests starting the math series from the beginning. This volume starts with adding and subtracting numbers up to 5 and ends with multiple digit multiplication and long division with decimals. This is a full curriculum with tests and the problems are worked out to see the answers. I hope to be done with this volume by the end of the year. Sky did a brief review by watching the 3 Crash Course A&P Immune System videos YouTube. Sky kept up with the progress of the pups at Wolf Park. 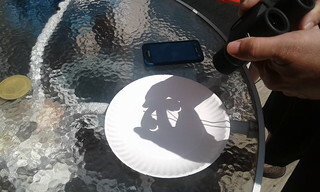 Yes, we made a projection of the solar eclipse, only 90% where we live. We watched NOVA: Eclipse Over America and NASA’s live coverage. I am using Zinn’s A Young People’s Guide to the History of the U.S. for Little Sis this year and will be adding Crash Course and Tom Richey videos for Sky. I don’t know how I exactly feel about Zinn’s book yet. I like that history is told from a Liberal perspective. I did think it would be a bit more politically correct though. I doubt they call People of Color, blacks. So why still call Native Americans, Indians? Even the girls were getting frustrated by the constant reference. Indigenous or Native anything would have been better than Indians. I will continue using it, for now. Hopefully, it gets better. We read Who Was Christopher Columbus. History Summarized: The Mayas, Aztecs, and Incas from Overly Sarcastic Productions and Water and Classical Civilizations from Crash Course on YouTube. Sky watched Crash Couse Film History episodes 5-7. We will be watching German movies these next couple weeks. Clouzot was one of those directors that worked for German cinema. 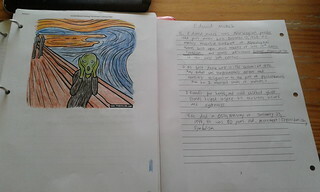 The girls learned about Edvard Munch. Both girls found Instagram over the summer. Slime and slime videos are all the rage. 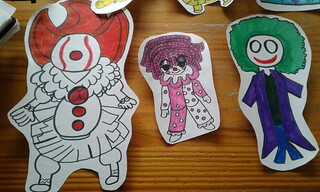 Little Sis has been making fan signs for her followers. She made over 20 of them. It feels good being back in the swing of things. I think all of us needed the exhale of summer break. However, as Sky likes to quote “Winter is Coming”. Time to inhale. Still lots of the same. flexibility, and practice (always practice). 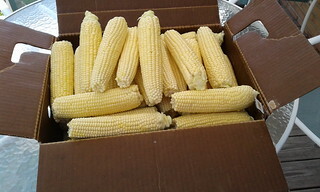 Our year supply of corn is ready for winter and spring. As always, reading for mama (and the papa now having his own Kindle, reading about Deadwood, gearing up to start a new television series). I finished: You by Caroline Kepnes, (Loved it, and no I do not understand all the Joe fan girls.) and Dark Saturday by Nicci French (Loved this one too.). Wish I can say the same about: Don’t Close Your Eyes by Holly Sheddon (I had really high hopes for this one) and Bring Her Home by David Bell (Actually gave up on it. Okay, his wife died. I am still reading about it 10 chapters later when the plot has nothing to do with her. Maybe, it does but I am not reading anymore to find out.). 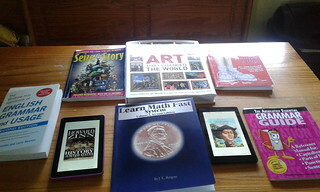 As for school, I ordered the first two math books in the Learn Math Fast curricula series. 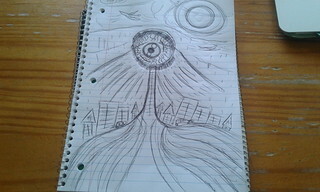 Sky took a crafting notes webinar through Beasley College (learning about the KISS elements). Sky has been keeping track of the wolf pups’ progress through the Wolf Park blog too. She will be writing one of her essays about this. I made both Little Sis and Sky’s book list out for the year. After we wrap up Scandinavia, we will finish up American history, literature, and government this year. 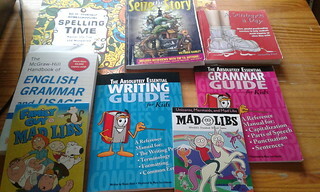 I thought I would make things easier on myself this year and just order curricula. 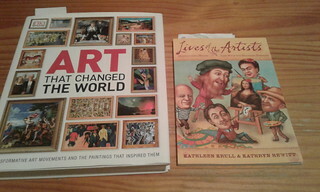 However, the more I read over the book lists, the more discouraged and mad I became. Not one bloody diverse book. Not one Mexican-American, Native American, or person of color author. NONE! No LGBTQ authors, hell there was barely any females on the list. This is supposed to be secular?? Thank goodness for Harper Lee. I mean, I guess she is the only American female to write a novel. I will share the list I came up with as we go (Don’t want a longer waiting list from our library.). This is why I have always put together my own resources, to begin with. Might as well finish it out this way. Only two more years to go for one child. Last, I decided to use a portfolio as my high-school grading system (which is another reason I started this blog). Yes, I will have the 4-A, 3-B, 2-C GPA for colleges. However, I refuse to start giving the girls grades now. 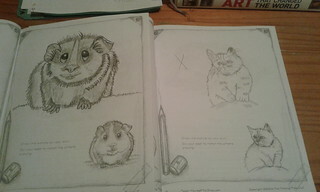 They have gone all this time without being graded, I am not going to change to be like some dog jumping through a hoop. 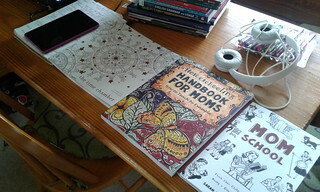 Homeschooling has always been my own little experiment. If a child did not retain information over the summer, then just maybe they never learned it in the first place. Alright, how about another quick update? 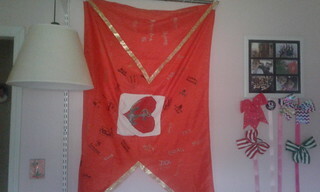 Little Sis made it to cheer camp (150 miles away) and came back with her team’s spirit flag. Only 6 out of 300 girls were awarded this honor. She had a blast and can not wait until next year. Swimming, bowling ( both girls getting strikes), tumbling and flexibility classes for a certain cheerleader. Finishing touches to Little Sis’s room. Fourth of July celebration, food and fireworks. Batman, Batman, Joker (Movies and Animated series). Drive-In summer movies. Spider-man Homecoming and Despicable Me 3 being huge hits. I’ve finished several books. The Child by Fiona Barton being the latest. I really enjoyed it, until I figured it all out. Then, I became frustrated that no one else could. It was still a good read though. Indiana’s children are gearing up to start school in the next couple of weeks (Yes, they go back in July here). This means less crowds at the pool for us. I have been thinking about our next school year. I think it is time to readjust our schedule again. I really didn’t realize how much all of us needed this break from academics, myself included. I need an open and go math program for the girls. I think I may have found it (Learn Math Fast). Fingers crossed.